When you're a munchkin, every day can be Christmas, with all that loot out there in the world, just ripe for the plundering. The rest of the world hasn't quite caught up to this enlightened philosophy, however, and so it's up to us to start the ball rolling. 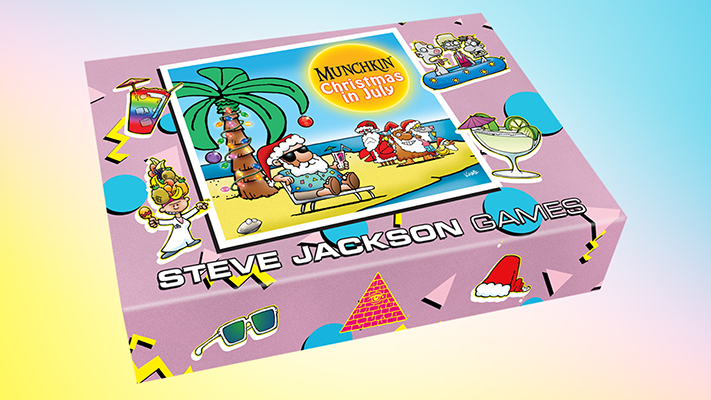 Next Tuesday, we'll be launching the Munchkin Christmas in July Kickstarter, your chance to get well over $90 worth of Munchkin loot for $60, which includes U.S. shipping. (Sorry, we can't offer international shipping on this one. We'll have some tips for our customers around the world who want to use a U.S. forwarding agent, or you can hit up an American friend to order it for you.) We'll include our usual assortment of promo swag in this one, and we'll also have some stretch goals to make the boxes better for everyone. And if you're among the first 150 to back the project, Steve will sign the bookmark inside your box! Make sure to follow us on Kickstarter and all our social media (Twitter, Facebook, Instagram) to be the first in your group to know when this Kickstarter is live. And, hey: Merry Christmas!